I am fascinated with anything that has to do with Technology/the Internet, but I never had the opportunity to explore because there was no access to a computer due to affordability. Ajegunle LIFE program has brought about development in my community and a lot of youth including myself have benefitted from the digital inclusion initiative. Though I had a little background on the use of a computer this cannot be compared to the exposure I had during my training at the AjegunleLIFE Centre. I didn’t want to attend the training because I believed there was nothing new to learn, but my parent made me understand that there is always more to everything and also hearing a family friend’s testimony motivated me to aspire for more. The Training Centre is a conducive learning environment; with the stat of the art infrastructures and equipment, dedicated facilitators, and highly intuitive students. We were encouraged to carry out research works, which has been very helpful till date. Being connected has really made a difference in my life because it has given me the opportunity to reach out to an audience beyond my immediate community. The skill I have acquired has really helped me in many ways, most especially the Life skills- “Self-awareness and Time Management”. Learning about these has really been an added advantage in my day to day activities. I currently work as a “Computer Operator” at Ajegunle Diagnostic Centre, managing the laboratory’s database and sorting out (printing, typing, editing) of scan and test results. I am also improving on my ICT skill by learning Programming related courses online and also building myself to becoming a “Media Strategist/Publicist”. 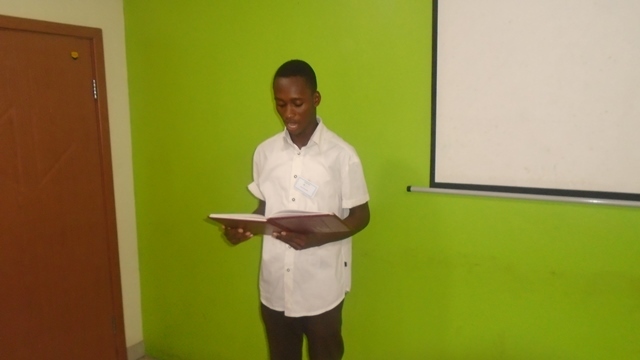 The AjegunLIFE program has really instilled in me, a self and continuous development mindset. The training really inspired me a lot and I want to especially appreciate Mr Odunsi Oluwaseyi Gabreal and Mr Taiwo Olalekan for their relentless efforts in making me a better person. Thank you Paradigm Initiative for connecting us to the world that seemed beyond. We are pleased to announce the addition of two new members to our Advisory Board: Drs Jummai Zainab Umar-Ajijola and Aida Opoku-Mensah. Dr Jummai Ummar-Ajijola brings to the Advisory Board her experience spanning three decades, several countries and across both public and private sectors. She is presently the CEO of the Business People (tbp) Limited and was previously the Corporate Social Responsibility Lead for Microsoft Corporation. She has served on several committees, including the Presidential Committee on Drafting the Community Radio Policy as Member/Secretary; Coordinator, Women’s Group & Member Central Working Committee (CWC) Vision 20:2020, Joint Consultative Committee on National Framework for Building Partner Ecosystem, amongst others. She is also a regular contributor to socioeconomic and political discourse on radio and television. The two accomplished women join Professor Pat Utomi, former presidential candidate and co-founder of Lagos Business School, Dr Oluseyi Adebayo-Olubi, a partner at O’bibi Consult, Mr Nick Jekogian, a successful entrepreneur and investor, and ‘Gbenga Sesan, the Executive Director of Paradigm Initiative. With the new additions, the Board is now in a better position to guide Paradigm Initiative to become Africa’s leading outfit on digital inclusion and digital rights. I am currently a student at the Adeniran Ogunsanya College of Education. I have employed most of the skills I picked up at the #AjegunleLIFE centre. The research skills have really helped me in delivering quality assignments and general class performance. I am generally considered tech savvy by my peers and lecturers because of my swift reaction to academic works that have to do with the use of technology, like; email, word processing packages, Excel, etc. I have trained couple of persons on how to use the computer for different purposes, I taught my aunt to use Microsoft word, excel and powerpoint, I also taught my friends who wrote the computer based UTME how to use the computer. Thanks to Paradigm Initiative for making me stand out among my peers. I came to the AjegunleLIFE center as a street boy and I wasn’t expecting much from myself or life. I didn’t want to attend because I thought it was going to be too strict for me to handle. It is a totally different story today; I can say that I got my sense of direction from the training. I never had any serious ambiton or the intention of going to school, but I am now a final year student at the Olabisi Onabanjo University where I am studying laboratory technology. I never had access to a computer before the training, the program gave me the opportunity. The program changed my life. I encourage the current beneficiaries to strive beyond self or societal constraints limiting them from maximising their full potentials. They should try to create milestones and stop at nothing to pass them. Thank you to Paradigm Initiative for shaping my destiny. At Paradigm Initiative, we believe encouraging citizen engagement and transparency ultimately leads to a more accountable society. We remain resolute in ensuring that citizens are encouraged to speak up and expose improper and detrimental action in the society and that they are protected against sanctions for exposing societal ills. It is against this background that we have been actively supporting advocacy for whistleblower protection in Nigeria, clause 10 sub-clause 17 of the draft Digital Rights and Freedom bill (HB. 490) makes provision for the protection of whistleblowers against sanctions. Recently we participated in a symposium on Whistleblowing at the Nigeria House of Representatives. 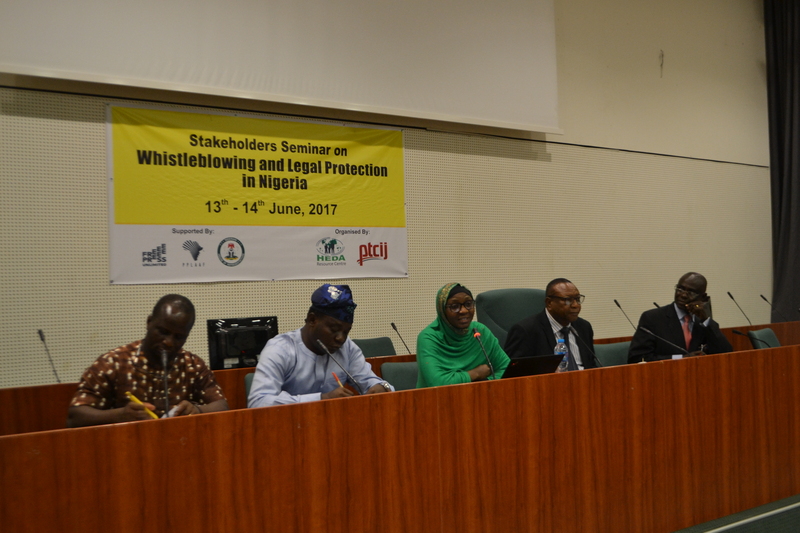 The Stakeholder Seminar on Whistleblowing and legal protection in Nigeria and held on the 13th – 14th of June 2017 and had panels which comprised of members of the House of Representatives committee on financial crimes, CSOs, Representatives of various government and UN agencies. The objective of the seminar was to fine tune the draft whistleblower protection bill at the House of Representatives and had the draft bill analysed for weak points and necessary adjustments. It is important to note that the Senate is also in the process of passing a version of the bill, The Whistleblower protection bill SB 158. The bill makes provision for the protection of whistleblowers against any act of retaliation and ensures that their disclosures are appropriately handled and has a section which avails prospective whistleblowers right to anonymity. It is currently before the Committee on Judiciary, Human Rights and Legal Matters, awaiting Committee Report. The seminar was declared open by Rt. Honourable Yakubu Dogara the Speaker, House of Representatives. He stated that the Bill for the protection of Whistle Blowers is a vital tool in the war against corruption in Nigeria and that when passed, will make more information available for investigation of alleged corruption and misuse of power by public servants. This was followed by the opening remarks by Hon. Kayode Oladele, the Chairman, House Committee on Financial Crimes. He said the Workshop was aimed at enriching the content of the Whistle blower’s protection bill which is critical in the fight against corruption. He gave the objective of the workshop as to enhance the synergy between the members of the House Committee and CSOs in tackling financial crimes in Nigeria and to give participants the opportunity to make an input to the draft bill and facilitate its passage. The panelists said that the bill when it becomes law will tackle the issue of poverty and corruption in Nigeria and opined that a fund should be set up for Civil Society Organisations (CSOs) so as to empower them and in doing so tackle the root of corruption and that the government should create an enabling environment so that citizens will be motivated to report improper acts. Distrust between citizens and the Government and how this can hinder the whistleblowing process was outlined. In this panel, the reporting process (lack of prompt response on the side of law enforcement agencies) was also identified as being a limiting factor. It was suggested that the gap between the time of reporting and time of response should be addressed by putting prompt response mechanisms in place. Another panel was on “Espousing the internationally recognised guiding principles of whistleblowers laws”. This panel outlined the whistleblower protection situation compared with other Countries. Day 2 started with a keynote presentation by the representative of the Chairman of EFCC titled “Citizenship and fight against corruption; promoting civil participation and protecting actors under a whistleblower protection law”. He affirmed the commission’s resolve against corruption and to support causes that align with the anti-corruption war, noting that the whistleblowing protection bill was a step in the right direction. The first panel for this day was titled “Citizenship and ownership of the Anti-corruption war; an opinion on the incentive based policy”. Panellists pointed out that there was no dedicated agency outlined to report whistleblowing cases. The second panel merged two panels together, which are: “Press freedom and whistleblower protection: Reviewing the provisions, standard and prospects of the laws and bills” and “Building a stakeholders engagement and strategy for enacting a whistleblower law: media and the law”. It was noted that the guidelines from the bill were gotten from transparency international. It was also identified that the draft bill did not make provision for anonymous whistleblowing and this was recommended. A broad definition of “retaliation” was also recommended to be defined as well as the fact that immunity should be given to whistleblowers from these retaliations. A victimised whistleblower from a government commission then shared his whistleblowing experience. The Panel on “Committing CSOs to partnership and expeditious passage of the bill” was the third panel for Day 2. Discussions ranged from how Civil Society Organisations can drive the anti-corruption campaign by advocacy and enlightenment. Panellists advised that CSOs need to come together to bring their strength (technical support) into the whistleblower protection law making and implementation process. They enumerated the need create a secretariat dedicated to the support of the policy. The last panel was on “Whistleblowing in the corporate world; prospects and challenges”. A panellist shared reasons, why people are discouraged from whistleblowing, according to a study in key cities in Nigeria, was largely found to be fear of retribution and apathy. The panel identified the need to make room for independent reporting mechanisms so people who are willing can stand in for others who do not wish to be identified as whistleblowers in the bill. Recommendations for an all-inclusive draft bill which speaks to every identifiable obstacle to its passage and implementation developed. Whistleblowers face a number of challenges from threats, harassment, discrimination and sometimes outright dismissal by their employers. This implies that an effective protection system should be in place to prevent these instances. Although, the Federal Government had a whistleblowing program by the Federal Ministry of Finance (FMF ) at the moment which encourages disclosures of financial impropriety. There is no legal framework yet that backs whistleblowing in Nigeria, this is what the draft bill seeks to address. The FMF whistleblowing programme allows for disclosures to be made via an online portal, it also provides for anonymous disclosures and suggests that confidentiality will be maintained to the fullest extent possible within the limitations of the law. There are bills similar to the whistleblower protection bill currently before the National Assembly; they include the Witness Protection Programme (Establishment etc), SB 157, which was passed on Thursday, 8th June 2017 following a report submitted by the committee on human rights, legal matters and judiciary. Another similar bill is the Public Interest Disclosure Bill, HB 03 which allows for people with disability to make disclosures. Paradigm Initiative identifies with the need for accountability in all aspects of public and private bodies and officers’ conduct. We understand that for the anti-corruption drive to be achieved in Nigeria, people must be encouraged to speak up against improper actions. Also, those who wish to speak up shouldn’t be compelled to identify themselves and should be given equal opportunity. Clause 4 sub-clause 3 of the Digital Rights and Freedom bill (HB. 490) provides for anonymous speech online. We will continue to support and engage ongoing advocacy effort for the protection of whistleblowers in Nigeria especially online. 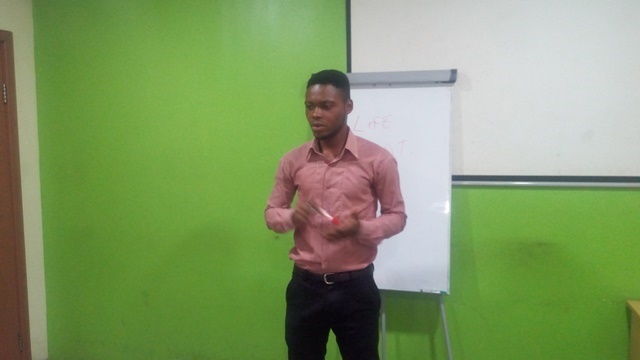 Oluwaseun Ajayi is a Google Policy Fellow with Paradigm Initiative. She works with the Magoyi team in our Abuja office.